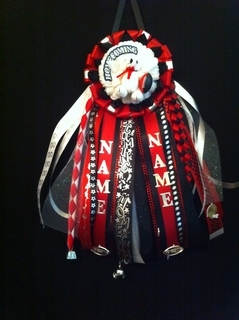 Homecoming mums are a big part of high school homecoming festivities in the Dallas Texas metroplex. The first homecoming mums were given in the 1930's at high school homecoming football games across Texas. Real chrysanthemum flowers were presented to their dates in the form of a corsage. The chrysanthemum was chosen because it is a very rare, and beautiful flower. Get your Varsity Mum today!